Y'all - I'm obsessed with day in the life posts. I'm not sure why - but I LOVE them! Shay and Erika both did one recently and so I decided that yesterday would be the day! I woke up around 5:30 a.m. - I check my email, consult my planner and have some quiet time for about 25 minutes. Yesterday I made a cup of tea and grabbed some pumpkin and zucchini bread to snack on while I got ready. I showered on Monday night, threw my hair up in a bun on Tuesday morning and wore it damp all day. Wednesday morning decided to run the flat iron over it... it was a hot mess! The side on the left was almost done - the side on the right I had already done the bottom two layers. Crazy. I typically pick out my outfits the night before (one less thing to think about in the morning!) and yesterday was no exception. I paired a crazy old sweater tunic (like.... I wore this before I had Luke old) with a Matilda Jane crochet cardi and leggings with TOMS ballet flats. While I'm getting ready, Dave will usually wake Luke up, grab some breakfast for him and make sure he gets dressed :) Some mornings the littles get up, sometimes they're still asleep when we leave. We try to walk out the door at 7 a.m. so it just depends. This pic is actually from a couple weeks ago (my pic from today ended up blurry), but gives you the idea :) We do kisses and they usually walk Luke and I out to the van with Dave. This particular morning Luke and I swung through the donut shop to pick up donuts for my small group (and a chocolate twist for Luke!) and then we popped in to Starbucks (duh!). We got to school around 7:25 and I started getting everything ready for my first period (which starts at 7:45). We ate donuts, did our devotion and prayed for each other and then I taught two 8th Grade Pre-Algebra classes and an 8th Grade Algebra 1 class. Lunch is 25 minutes and some days I'll head to the Student Life Center to eat with my co-workers, but yesterday I was trying to get a review packet prepped and drawn out so I opted to hang out in my classroom. I snacked on some chips and ate an apple - entered some tardies and got ready for my 7th Grade Pre-Algebra class that meets after lunch. Once that class is over, I have two back to back planning periods. This is typically when I choose to eat my lunch because I don't have to rush. Today was a quesadilla with guacamole (perk of having a hubby in the food/bev industry. hahahaha). I spend my planning periods answering emails, grading papers, entering grades, prepping tomorrow's lessons - and today, I spent most of it working on Homecoming details. I'm the Middle School student government sponsor so I'm working on LOTS of fun stuff for our Homecoming Week. I drafted emails, finalized t-shirt designs, called DJs and worked on planing out Middle School Homecoming Court, spirit days and our involvement in Tailgate. Fun stuff. Before I left, I made sure that my table boxes were stocked and ready for my classes tomorrow... this way I'm not rushing around in the morning looking for supplies. One last assessment of what I need to bring home and I'm off to grab Luke from Extended School Supervision (ESS) around 3:50. We're home around 4:35 and out of the car around 4:40 (if everyone is being quiet and snacking, I'll answer emails and just "have a minute"). I was SUPER excited to get this invitation in the mail! We can't wait to welcome Baby Griffin!!! We've got our iced tea and are headed inside! It was an exciting mail day.... my Matilda Jane promo order arrived early and some super cheap Boden baggies I found for Mason came as well! (Mason LOVES Boden baggies and he wears them almost year round. When they go on mega sale I pick them up for this season and next). Griffin immediately starts filling up her new MJ bag with magnets and then settles in to drink a bottle. She drinks out of a cup (with a straw) pretty much all day, but after school she still loves a warm bottle. The boys were playing Legos, GG was watching Sofia the First and drinking a bottle and I was changing my clothes as fast as I can. hahaha. Mama is in her sweats and Mama is happy!!! Dave got home a little after 5 and he and Luke sat down to read the new book he made, go over his box of sight words and finish up homework. Luke made himself a sandwich and he and Dave were out the door by 5:40 to head back to MCA for soccer practice. On soccer practice night dinner is typically leftovers. Griffin had pasta with meatballs and Mason wanted pizza. On a typical night we would all sit at the table together, but Mason was coloring and I was prepping dinner for Dave and Luke so I didn't end up sitting with the kids. Once dinner was wrapped up I popped Griffin in the sink (easiest bath ever!) and I was able to put the baked spaghetti in the oven and get some things ready for lunches on Thursday. Mason is ALL ABOUT markers - and he decided to color some more after dinner. I put G to bed at 7:10, picked up in the boys room and laid out some clothes for Mason. ... and pulled out clothes for a great friend who's doing family pics this weekend :) Can't wait to see her baby girl in one (or more!) of these outfits. After soccer Luke and Dave ran by the grocery store to pick up a few things and when they got home it was straight in the shower for Luke Man. Seriously... when did he get big enough to shower?!?! While Luke was showering (Mason was STILL coloring!) I took a few minutes to put away some jewelry and stuff that had been accumulating in my typical "drop spots" (do y'all have those??) while drinking a blackberry lemonade my awesome hubby picked up for me while at the grocery store. It's currently 10:48 p.m. and I'm about to go wash my face, jump in bed and watch the Big Brother Finale with Dave while I grade a couple sets of papers (and probably eat a bowl of Special K - hahaha). I'm hoping to be asleep by 11:45 or so. So - there you have it! A day in the life of me :) Wednesdays are hectic and busy and a little out of our "norm", but they're usually great days. Hope y'all have a GREAT Thursday and don't forget to come back tomorrow and link up to Friday Favorites! Andrea, you are seriously super mom. Holy cow. That picture of Griffin laying on the sidewalk is hilarious! That girl drama .... bless! Two words.....Wonder woman! Seriously you are amazing. Hi. I teach also so this seems so familiar. Some days the multi-tasking feels CRAZY. Seeing it from another perspective reminds me how lucky I am to do both. Thanks for sharing and making me feel less CRAZY...or at least not alone in the crazy. :) Have a great day! Your day in the life posts seriously make me tired!!!! I keep reading but in the back of my mind I'm wondering when it's time for bed!!!! I love, love, love these posts!!! I'm so glad you did one!! You are incredible - reading your post I had you ready to crawl into bed by 7:30 from sheer exhaustion but you still had hours left in you!!! Seriously you are a gift to your family and students!!! Thank you for this post. I don't know how I stumbled upon your blog, but reading it has been such a blessing to me. I also have three kiddos (all boys though...no fun girl clothes, but I wouldn't trade them for the world!) and I am also a teacher. I've been feeling very bitter lately that I spend all day with other people's kids (kindergarten) and not my own. And when I get home, it's go go go. Your evening sounds very much like mine. Reading your post has given me a different perspective. I need to let go of the bitter and embrace this life of mine, treasuring even the mundane tasks while my kiddos are still young. They will be grown in the blink of an eye, I'm sure. God has used you to bless a stranger today. Thank you for that. Your comment totally spoke to my heart. It's hard. When I start feeling like that I often think about "what if I had a 9 -5 job". One where I left at 8 but wasn't home until after 6 and I didn't get school holidays off with my kids. I choose to work (hello, Private School tuition!) and so I choose to also make the most of the time I have with my kids when I get it. Quality, not quantity :) There have been days in the summer where I feel like I got less "quality time" with them than on some of my craziest school days. Praying for you today!!! You are so right...quality not quantity. If I had a choice, I would NOT work, but I guess I did choose to marry a teacher. :) We just couldn't make it without my salary. Your reply was just what I needed to hear. I read your recent post about why you blog, and I just have to say, there is NO doubt in my mind God is using you and your blog as a ministry. I've been praying for something to change, and your words have been just what I needed to hear. I thought I needed my situation to change...but I guess it is just my perspective that needed to change. Thank you again for your words. You are a blessing! Jen, a stranger in Missouri. Oh my word! I'm dying over the cute shirt made out of your MJC fabrics! What a creative idea. I have some MJC pieces that my little girl has grown out of and I've not been able to part with them yet. LOVE IT! Thanks for sharing your busy and blessed life with us! You and your husband are rock stars! Can he do a day in life post too? I love the pic of G under her blankie drinking warm milk. I wish I could do that too sometimes! Hi! We are searching for a high chair. What brand/model is Griffins? Love this post and your blog! WOWZER!!!!!!!!!!!!!! You are one amazing lady!! Where do you get your incredible energy? Seriously do you take special vitamins? You are soooo cute! Love your outfit but love your personality more!!! (I'm new here so I can't stop raving). Your family is so sweet but your baby girl kills me ! She's just as cute in a diaper as she is in her super fashionista outfits!!! I just love you!! Thank you for sharing your life. I feel motivated!!! wow - you are amazing in the way you get so much packed into a day - kudos to you! You are one busy mama!! I'm tired just after reading your post! Haha!! Thanks for being so open and honest...I have thoroughly enjoyed reading your blog every morning and following you on IG. By the way, my hubby and I love Big Brother.....Go Derrick!!! Thank you for your inspiration both as a blogger and a working mama! Love love love your blog! If you will put one of those mirrors on the back of the captain seat head rest where Griffin sits she will be able to see the movie from the mirror and wont have to turn her head :) It worked great for our little girl! You are a busy lady! Precious times working, family life, school and one day we'll look back and miss these days! Enjoyed your post! I can't believe you bathe your baby in the sink where you bathed a dog and prepared your dinner! Gross! :) (totally kidding). OK first love that shirt made with MJ scraps hard, 2nd your jewelry collection has me swooning, 3rd I can't decide if I can pull off the MR leggings but man I want to try, & last, you're awesome! God bless and have a fantastic weekend! Andrea this has been so fun! Thanks for sharing a closer peek into your life! This post was sooo interesting!! You are one BUSY woman! I can't believe you don't go to sleep until 11:45 pm and get up at 5:30 am! I think your three children and students are blessed to call you mom and teacher. Andrea, you are the queen of multi-tasking! I loved reading this post and seeing how much you do with your family, teaching, side projects, and the list goes on. That tea must give you lots of energy ;-) I love that your sweet hubby makes special deliveries for you. You guys make a great team! With our 5 kids and all five in sports AND I work full time....I understand busy. I wish I could live on 5 hours of sleep....I have tried. I have to be in bed at 10 to be up at 6 or I am a zombie mommy. LOL! Thanks for sharing!! What a great Mommy you are...I am tired reading this! 2014 edition of the Proverbs 31 woman! Your family is blessed to have you! And... that blanket your cute little daughter is cuddling with looks SO cozy! You are my favorite blogger!! 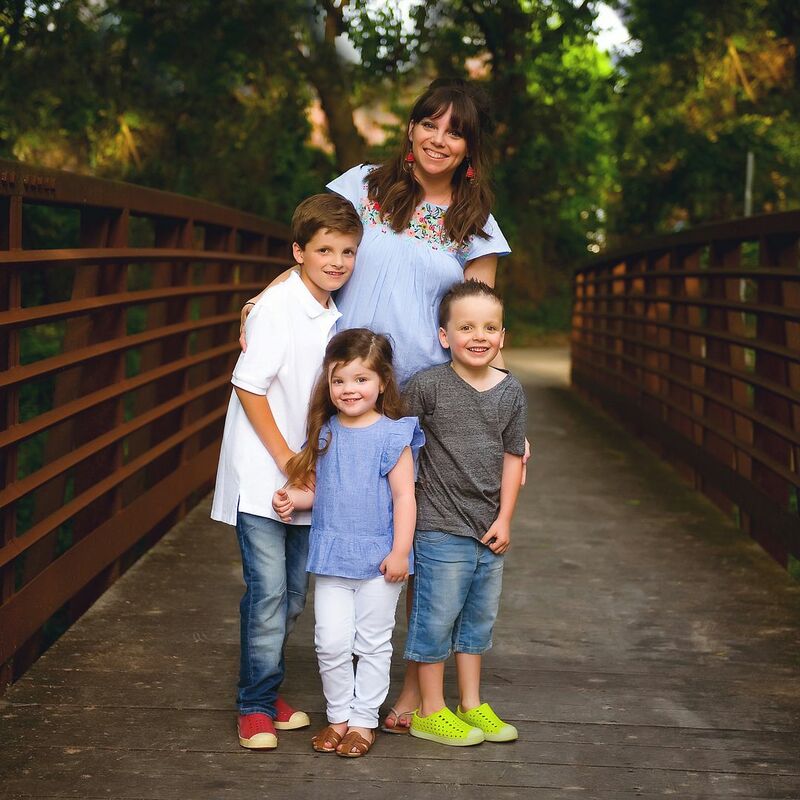 Looking at how you run this blog AND teach AND raise three kids is AMAZING!!!! I am exhausted!!! I dont know how you keep running around like you do! Truely a Proverbs 31 Women! Love these post! Thanks for giving us a glimpse inside your little crazy busy life!! I love seeing these post, I can so relate to them-I'm going to have to do one myself soon. Oh my goodness. How in the world do you ever keep up that pace! You are a terrific mother to your beautiful kids and obviously a wonderful wife and great teacher. I love reading your posts and seeing all the cute pictures of your sweet family. Keep doing what you're doing and remember to take the time to enjoy every second with your precious kids because they grow up so fast. Thanks for bringing a bright spot to my day! I'm exhausted just reading your post...haha! Busy, busy! Love these posts too, I want to do one too, but well I work from 5am to 5pm...so that wouldn't be too fun would it? haha. I just LOVE day in the life posts and this was great! You are one busy mama and I think I need a nap after reading about your day! I think slightly askew designs should make us a printable of that quote. I love it! Totally agree -- I read that like three times and thought, "Wow, what an amazing quote to keep where you get ready or see it every morning?" Great post too!! Love your blog! I love this post! How fun will it be to look back at this one day! This is the best "day in the life post" ever. What you do is meaningful and God centered. You are an inspiration to us busy working moms!! Love this! Your crazy days seem similar to mine. I actually posted a day in the life post today, too! Wow, you are a super woman! It's so nice to get other working mom perspectives of their day. This is a great "day in the life" post. I was wondering how you did it all with three young children and now I know. You do ALOT in one day! I'm exhausted just from reading this! Wow! I am starting to think you are Super Woman. You have really got it together. You have such a cute family Andrea. I think your kids are just precious. I absolutely LOVE the way you dress your daughter. As for your husband, he is so nice looking!!! :) You are such an inspiration to me. You have the cutest kids ever!!!! Thank you for taking the time to do a post like tis. Love theses. And you surely earn all that Starbucks!!! Holy cow, you are busy and need as much fuel as you can get! And you have a beautiful family! Love these posts! I would need a nap to get everything done that you do! You are an amazing and productive mama!! I absolutely love reading the day in the life posts! My job is pretty boring, but I think I need to try this :) Thanks for sharing Andrea! do you freeze your meals in metal pans-if not what do you use? A previous comment stated that you were a "2014 version of the Proverbs 31 woman." Wow! What an amazing compliment and oh, so true! Thank you for being such an inspiration. Loved the post.... Thank you for sharing your day & your cute family with us. I think we all wish we could be friends with you in real life. You seem like such a fun person. I also wanted to say ( like a lot of your readers mentioned) that you are such an inspiration to all of us working moms out there, especially fellow teachers who struggle with the fact that work does not end when the bell rings at 3:30 p.m. That's the hardest part of the job for me and my husband, who also is a teacher. I liked your response where you stated to look on the bright side (common vacation times, short commute, etc. ), but sometimes I fantasize about a traditional 9-5 job where you leave work stuff at work. Is it crazy of me? Even after 14 years of teaching, it still boggles my mind that we have to "be on stage" instructing all day long and then do all of our prep, grading, lesson plans during our "free time" ....plus our planning period. It seems so impossible. Okay, I did not mean to turn this into a gripe fest. I apologize. But, I do want to let you know that it is encouraging to read a blog from a mama who also works outside of the home. The blogs I love the most tend to all be written by stay-at-home moms, which can make this working mom feel alone (and jealous, I'll admit). So, thanks for showing us your super-positive & mega-productive perspective on life through your blog. I love it! I teach 4th grade math in McKinney and Love Versatiles!! "She is clothed with dignity, strength, and a blardigan. Her color-coded planner laughs at the days to come." :D So inspiring to see you use your God-given talents to help and love so many near and far. Go girl! I remember you answered this before, but where are G's shoes from...LOVE them!! LOVE day in the life posts! As a fellow working mom, its always interesting to me to see how other working moms make it work. Also as a fellow Starbucks addict, what is a blackberry lemonade??? Looks and sounds amazing!!! Busy Momma! And you do it well! Wow. This is impressive! I only have 1 little one right now, and I don't do even 1/4th of that much in a day! I am always SO impressed with how much you all get done every day! I just one one little girl right now and am far less productive. You're a super-mom! Completely Agree. I went back to it and read it several times. In fact, it is going up on my mirror today!! Sometimes I need to read that without even realizing it. I'm a RN and tend to throw my myself elaborate pity parties...that craziness stops today!!! PS... I happen to think you are super Mom! What awesome things you did all day!! Thank you for sharing a "Day in the Life." I LOVE these types of posts as well-and may need to steal for my blog! ;) One thing I have a question on is this: as a working Mama myself and working late at times-working out is hard to fit in for me- Do you work out? If so when/how often etc?? ?